In a post apocalyptic setting, an alien civilization has invaded Earth. Players work together as part of a special ops team with the code name “ELITE”. They are dispatched to high priority missions – protecting objectives and defending vital targets against the alien invaders. 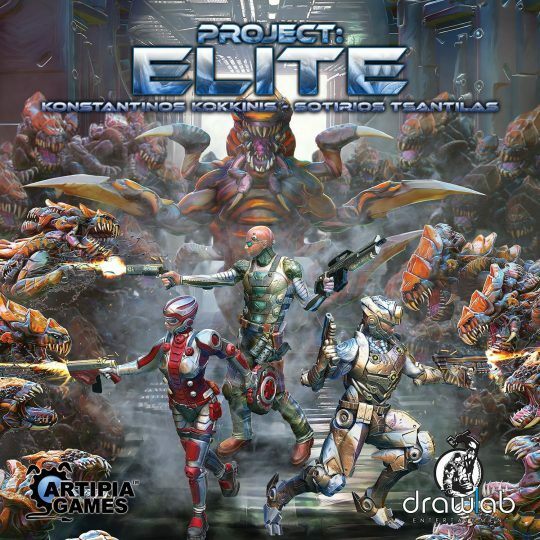 Project: ELITE is a co-operative, real-time, speed-dice, tactical, tower-defense-like game in which players roll dice with symbols as fast as they can allowing them to do various actions with their character on the game board. They move around shooting and cutting through waves of aliens blocking their advance while at the same time trying to complete objectives that will bring them to victory. The game consists of a number of real-time 2-minute rounds (depending on the scenario) separated by an AI Alien Phase where aliens perform abilities, advance towards their goal and receive reinforcements. The constant performance of actions through dice rolling combined with an innovative combat/movement system result in a mix of intense gameplay that offers countless hours of fun. What really makes Project: ELITE unique is the “Alien Move” symbol that appears on one side of each of the player’s dice and forces him/her to move an alien towards their goal. The end result is a real-time tactical board game where friend and foe are in constant motion, trying to prevail over the other.